Follow the link to download a pattern. 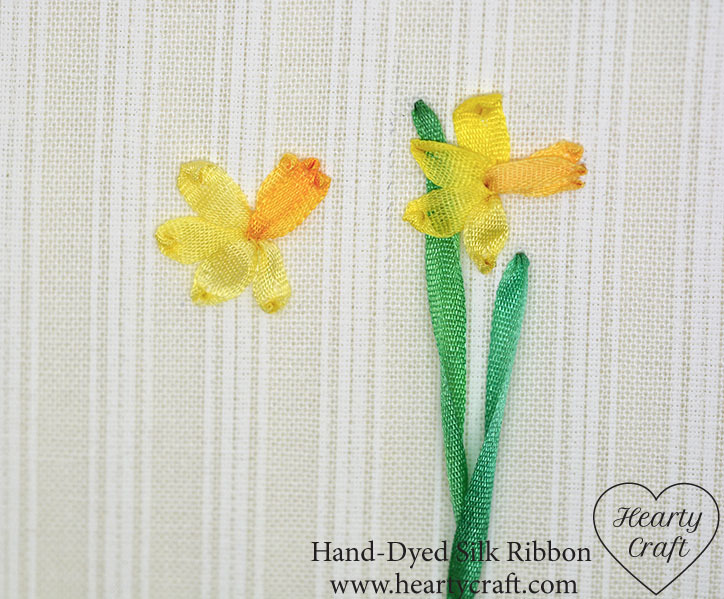 Even if you are not new to silk ribbon embroidery, the pattern might help when stitching the daffodils for the first time. Use Adobe Reader to open the file. Before printing set 100% scale in printing settings. Then using a HB pencil transfer the pattern onto a piece fabric. As soon as you transferred the image, place the fabric with the patten on top of a second piece, and mount them together in hoop. It’s recommended to use two layers of fabric for ribbon embroidery instead of one because silk ribbons are heavier then embroidery floss. Petals. Stitch four petals close to each other so that they are creating a semicircle and emerging from the same point. 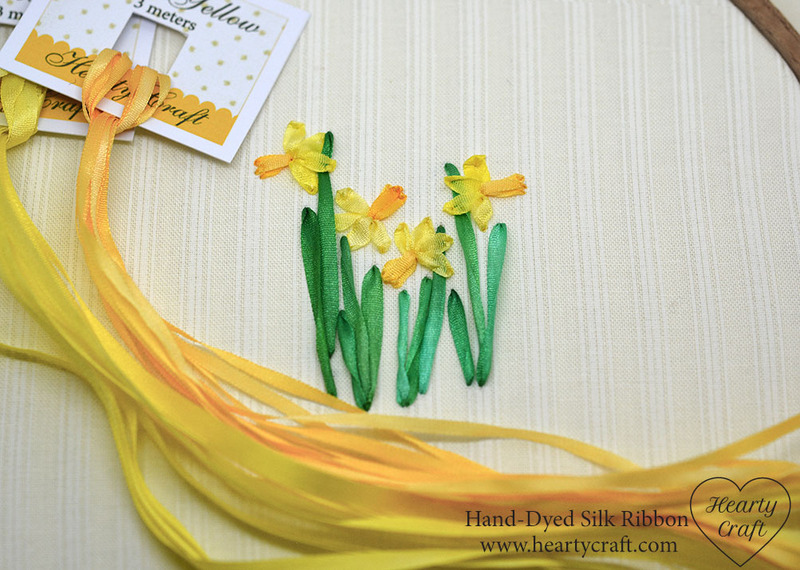 Each petal is a ribbon stitch with 4mm wide hand-dyed Yellow Sun silk ribbon. 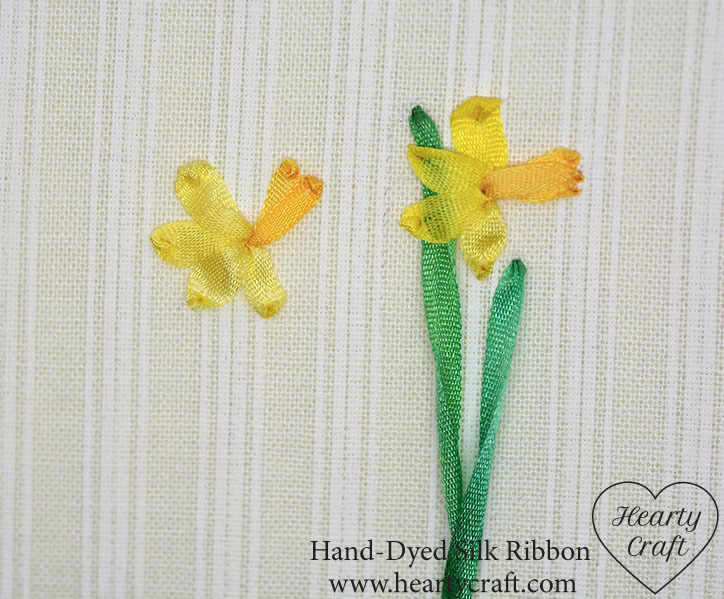 Follow a step-by-step mini tutorial on how to make a ribbon stitch. 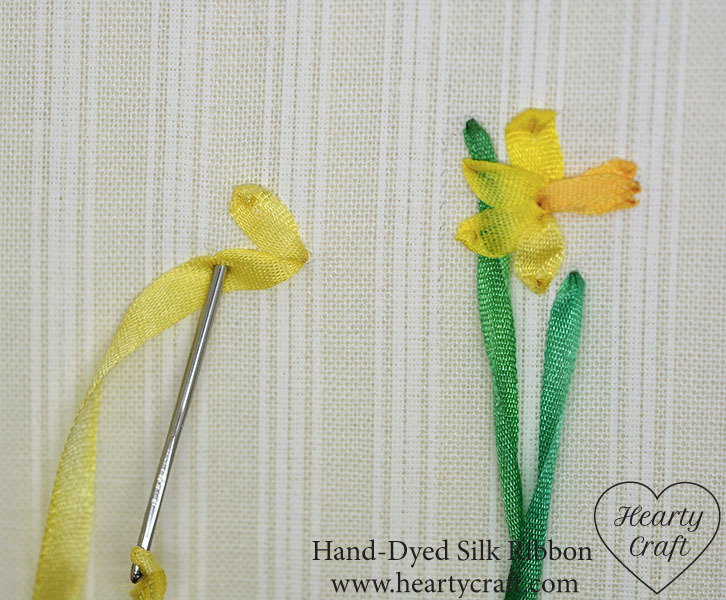 To make a cup, work two ribbon stitches with 2mm wide Gold Yellow silk ribbon. The stitches should start from the same point, be the same length, and make two sides of a triangle. Work the third ribbon stitch from the same point. Place the stitch between the first two so that it slightly overlaps them. It should also be a tiny bit longer. Leaves. The leaves are two or three straight stitches worked with 4mm wide Light Emerald silk ribbon. Whilst making the stitches let the ribbon twist slightly to create narrow leaves. Refer to this post for a straight stitch tutorial. Stitch all four flowers in the described manner. 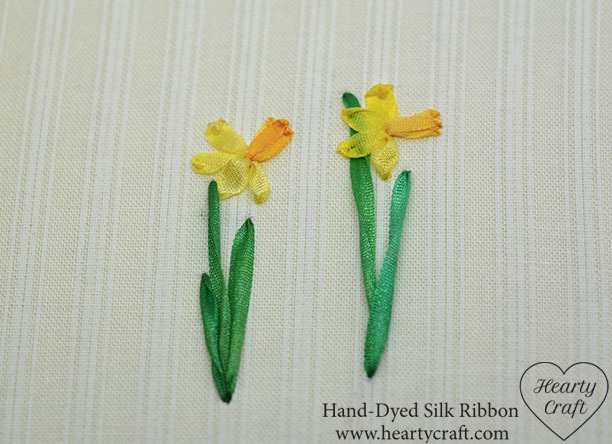 These daffodils do not have stems, but they might be added. 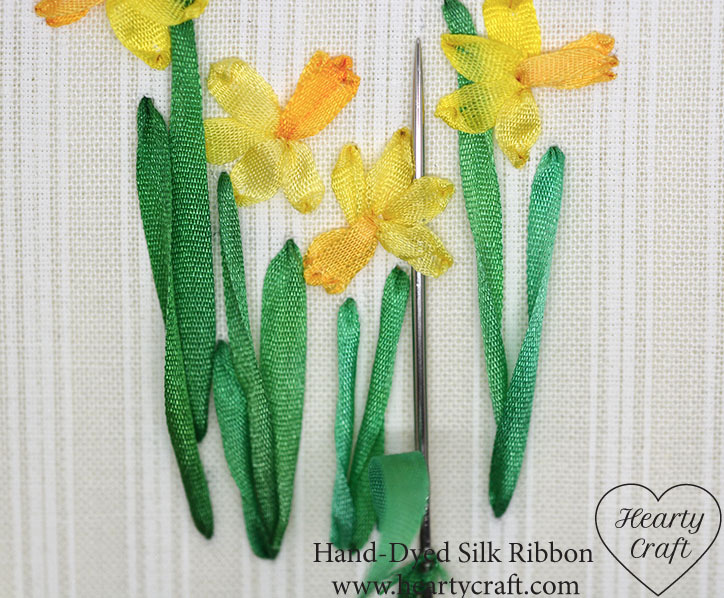 If you embroider just one flower, or want to create a more detailed piece, work the stems with a stem stitch or backstitch with one strand of embroidery floss. Stitch the stems before stitching the leaves. 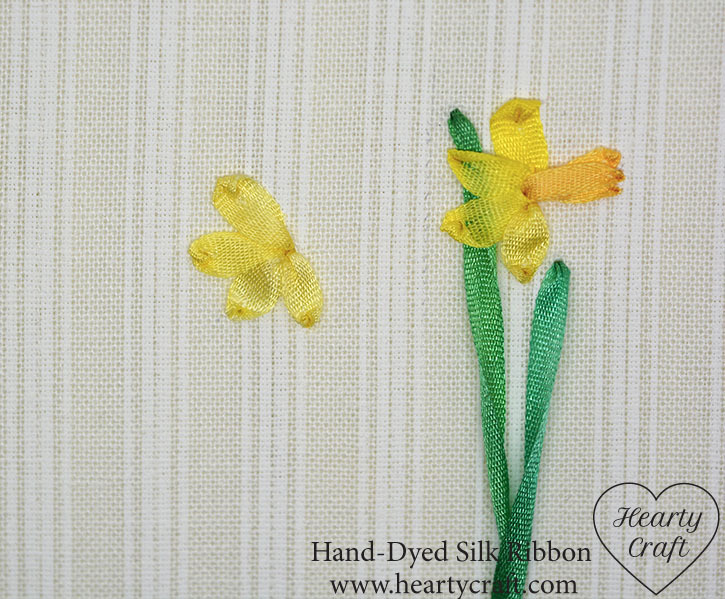 Enjoy the spring and give stitched or grown beautiful daffodils for those who are matters to you!